Home Feature 6 Signs You Are Overtraining! When it comes to healthy habits, too much of anything can backfire, and that applies to exercise as well. While most people suffer from the lack of exercising, once they get going, it can be addictive and some people do end up exercising too much — either by exercising too intensely or too frequently. Here are 6 signs you are overtraining! 1) You repeatedly fail to complete your normal workout. I’m not talking about normal failure. Some people train until they can’t go any further, and that’s fine. I’m talking failure to lift the weights you usually lift, run the sprints you usually run and so on; ie: regression. If you’re actively getting weaker, slower, and your stamina is deteriorating despite regularly exercising, you’re probably training too much. Pushing yourself to higher weights and failing at those is a normal part of progression, but if you’re unable to lift weights that you formerly handled with relative ease, you are overtrained. 2) You’re losing leanness despite increased exercise. According to BodyBuilding.com, if losing fat was as easy as burning calories by increasing work output, over-training would never result in fat gain – but that is not the case. Sometimes, working out too much can actually cause muscle wasting and fat deposition. You’re “burning calories,” probably more than ever before, but it’s predominantly glucose/glycogen and precious muscle tissue. Net effect: you’re getting less lean. The hormonal balance has been tipped. You’ve been overtraining, and the important testosterone: cortisol ratio is messed up. Have you been working out like a madman only to see your muscle definition decrease? You’re probably overtraining. 4) You feel restless and unable to sleep in your down time. 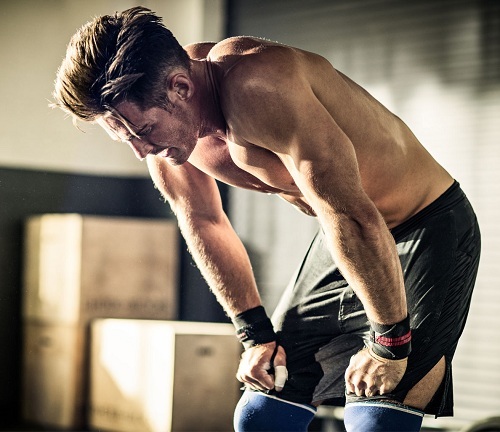 When you are overtraining, you will start having symptoms including hyper excitability, restlessness, and an inability to focus (especially on athletic performance), even while at rest or on your off day. Sleep is generally disturbed, recovery is slowed down, and the resting heart rate remains elevated. 5) You feel overly fatigued, sluggish, and useless. Too much resistance training can cause sympathetic over-training; too much endurance work can cause parasympathetic over-training, which is characterized by decreased testosterone levels, increased cortisol levels, debilitating fatigue (both mental and physical), and a failure to lose body fat. 6) You feel down after a big workout. One of the great benefits of exercise is the post-workout feeling of wellness. You’ve got the big, immediate, heady rush of endorphins right after a session, followed by that luxurious, warm glow that infuses your mind and body for hours (and even days). It’s the best feeling, isn’t it? We all love it. What if that glow never comes, though? What if instead of feeling energetic and enriched after a workout, you feel sketchy and uncomfortable? Exercise generally elevates mood; if it’s having a negative effect on your mood, you’re probably training too much.